Not just crusher but a complete service for your crushing business. Sand Making Machine (Namely PCL Vertical shaft impact crusher) is of high-power and low-consumption, which is designed depending on several years- hard work and study of mechanical mining equipment. Sand Maker absorbed the advanced technology of the same products of Barmac Company of America, now is of the international level. Sand Making Machine plays an important role in crushing minerals into pieces. PCL Vertical shaft impact crusher is widely used in all kinds of mineral, cement, corhart, bauxite chmotte, carborundum grain, glass raw material, machine made construction sand, stone stock and all kinds of metallurgy slag, especially carborundum, sintered bauxite, magnesite, and so on material with features of very hard and anticorrosion. And Sand Making Machine is more productive than other kind of crushers. Click here to watch more pictures about PCL-VSI Crusher! Stone less than 50mm enters sand making machine though conveyor belt. Stone is crushed by hitting other stones. Material falls down to impellor cavity. Under great centrifugal force, it hits material that coming downwards. After hitting each other, they force a vortex between impellor and shell, and hit each other several times, finally smaller stone comes out, and goes to vibrating screen. Satisfactory material is transported to sand washing machine, however overlarge material will go back to sand maker to be refreshed. Output sizes can be made according to customers requirement. 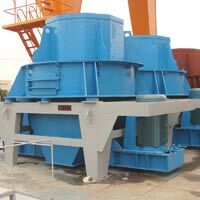 If input size is larger than the designed size, other crushing equipment will be necessary.